After three days of early morning rising, staking out news kiosks, reservations, and waiting for hours on long lines in the dark and cold, I am finally the proud owner of two Charlie Hebdos, with the by-now famous cover -- one for me and one for a friend in the US. I had to buy them at two different kiosks, because most places would only sell one at a time, to try to accommodate the most people possible. Three days after the new copy went on sale, the lines are still outrageous, and every single news kiosk is sold out immediately upon opening, with no exaggeration; the lines are actually there before they open, just waiting for the magical moment. One morning, the kiosk owner arrives at 10am, sees 30 people who've been standing in the cold for two hours, takes a photo of the line for posterity sake, and then announces, "I'm going to go get my morning cup of coffee, like I do every day. It will take about 10 minutes. Then I'll come back and open it up. Then I'll count out the number of reserved Charlies and if there are any leftovers, I'll sell them to you." It turns out all 42 are reserved, so none of us present in the two-hour line actually get one. But we are allowed to go in and make a reservation for the following day. Seeing us huddled and bored, he resolutely informs us, "I'm not going to change my morning habits," and he walks off to a nearby café. Arriving at work and immediately taking a coffee break, with no regard for the convenience of the customers is so French, and so funny, that Charlie Hebdo would be proud. I'm not making generalizations based on one kiosk owner, mind you. I get my second copy at a different kiosk where the owner does, and says, virtually the same thing. She arrives (late), looks at all of us, tells us she thinks she only has 20 copies, and then goes off for a coffee, leaving us there in the cold, counting out the first 20 people of our line. It turns out she had 26 copies delivered, and the remaining six people are glad they didn't give up; they were so close, and had already waited with us for almost 45 minutes, and their risk paid off. With all the demand, the capitalist American in me can't believe they didn't raise the price of the 3€ magazine. I'm amazed that nobody's trying to gouge us. I'm also amazed that this number of French people are calmly -- and fairly -- waiting in lines. If you've ever seen the French load onto a bus or ski lift, you'll understand my surprise. For Charlie Hebdos, on the other hand, the lines are friendly, calm, orderly. Even the person who is 27th in line, in this case, accepts defeat graciously. It is definitely the Charlie effect; we are all still a little skittish from the events of last week. I sense that whenever an emergency vehicle drives by, and everybody gives it their full attention. My friend who's waiting on line with me tells me that just after she and her husband moved to France, he was using a power converter for his computer and heard it pop and short out. He brought it to the store and asked for a new one to replace it. The salesman wouldn't give him a new one until he'd spent about 15 minutes testing to make sure the original was really broken, which he already knew it was. Then, at the end of the 15 minutes, he said, "You need a new one. I'm going to go have lunch, and I'll be back in an hour to sell it to you." And don't get any clever ideas about people staggering their lunch hours or breaks. When it's time to eat, the whole shop (or post office, government office, etc) simply closes down. No point in complaining to the manager, who will also be on the one-three hour lunch break. A recently-arrived American, my friend was nearly apoplectic, "But you're here now. I'm here now. The power converter I need is right here. And if you had just believed me and sold it to me when I asked for it, we'd already be done." If you've lived in France, you know what the salesman's response was: the eyebrows-up shrug that means "Look buddy, don't even bother. The break I am about to take in order to eat/drink coffee/have a cigarette is sacrosanct." The lessons of the week seem to be Don't Mess With French Freedom of Expression, and Don't Mess With French Coffee Breaks. This raw goats' milk cheese comes from Nord, the Northern region of France, typically cow country. The goat farm where its made is in the valley of Ecaillon, hence the name, and has been there sine 2008. Sometimes the cheese is more fully called Briquette de l'Ecaillon, in reference to its big brick-like shape. The farmer claims to spoil the goats, and perhaps it's true. The cheese is creamy, thick and sliceable, with an interesting hint of that Northern orange stinky exterior that you find on so many of the local cheeses (think Maroilles or Baguette Laonnaise, for example). Yet it's got all the interior characteristics of a fine goat cheese. The end result is stinky, salty, tangy, and sweet combined. This cheese is basically the same as a Domino cheese, with different wash/mold exterior. While the cheese is named after the valley in which it's made, the word "écaillon" can also mean "chip" (like the kind in your credit card) and "scale" (like the scales of justice). 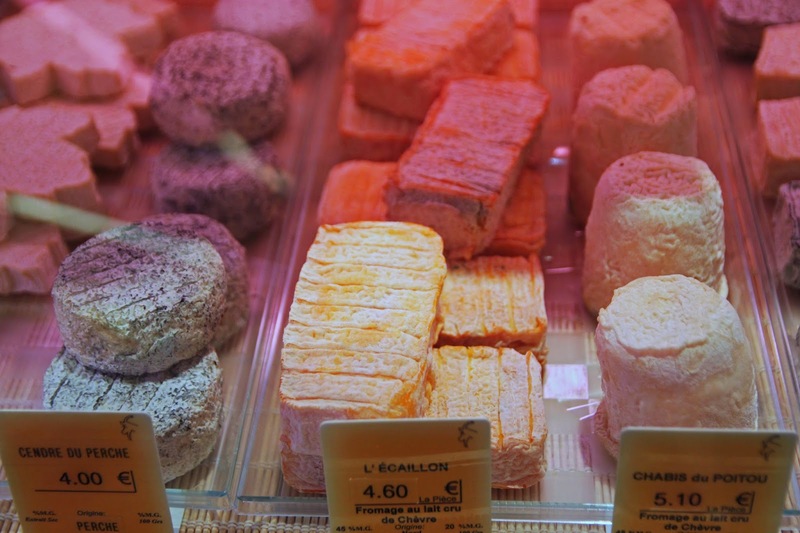 Since this is a story about how the French shop owners' sense of justice -- and habitudes -- sometimes interfere with maximizing customer payments (with credit cards, for example), Ecaillon seems to be the cheese to use. Plus, it's a delicious creamy cheese, and if you were a French shopowner who suddenly decided it was critical to break for fromage -- and all your waiting customers be damned -- this would be a fine choice.